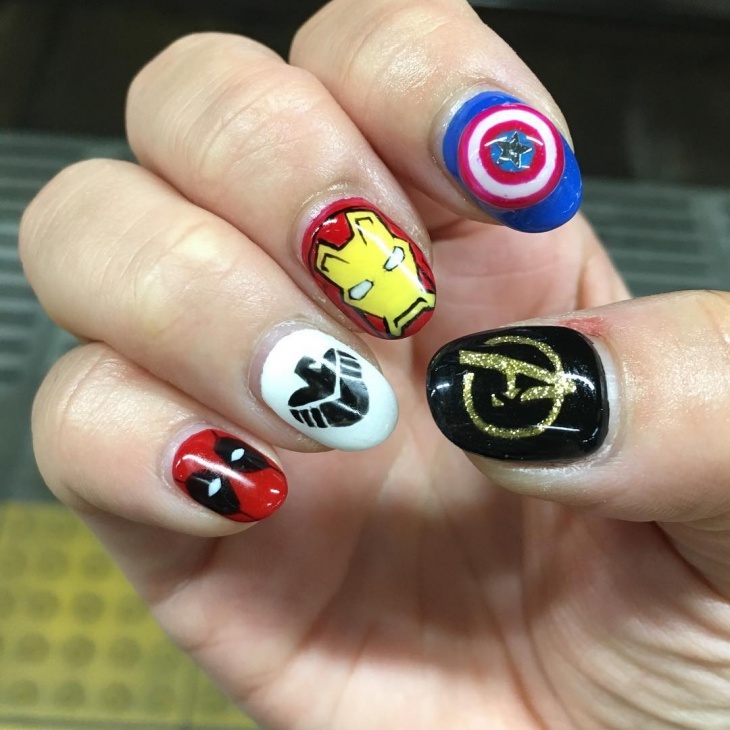 For all you nail art lovers out there, we have put together an awesome collection of superhero designs for all the Marvel and DC fans. 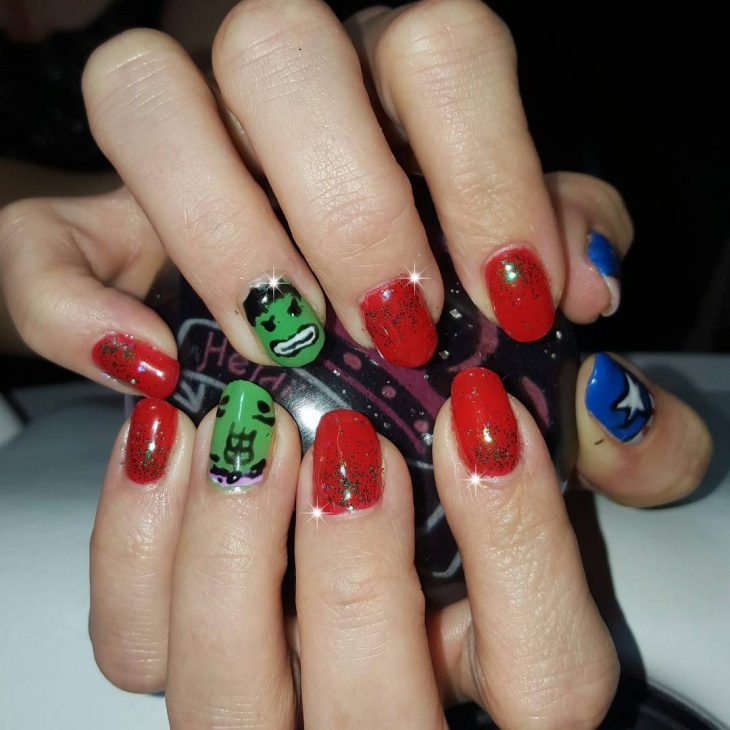 Ranging from stamping the Avengers insignia to capturing different moods of Hulk and Captain America, this collection is for those who have sold their souls to the super awesomeness of the Avengers and DC, and would love to show off their fandom even on the tiny part of their bodies. Read on for some amazing artwork options! Love sharp pointed nails? 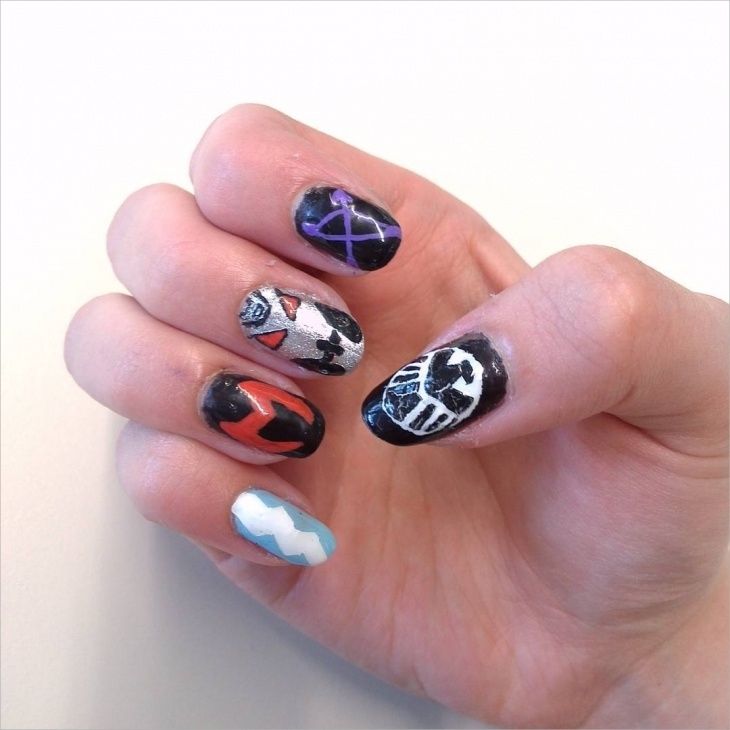 Why not club them up with your favourite Avenger crests from the Marvel universe? 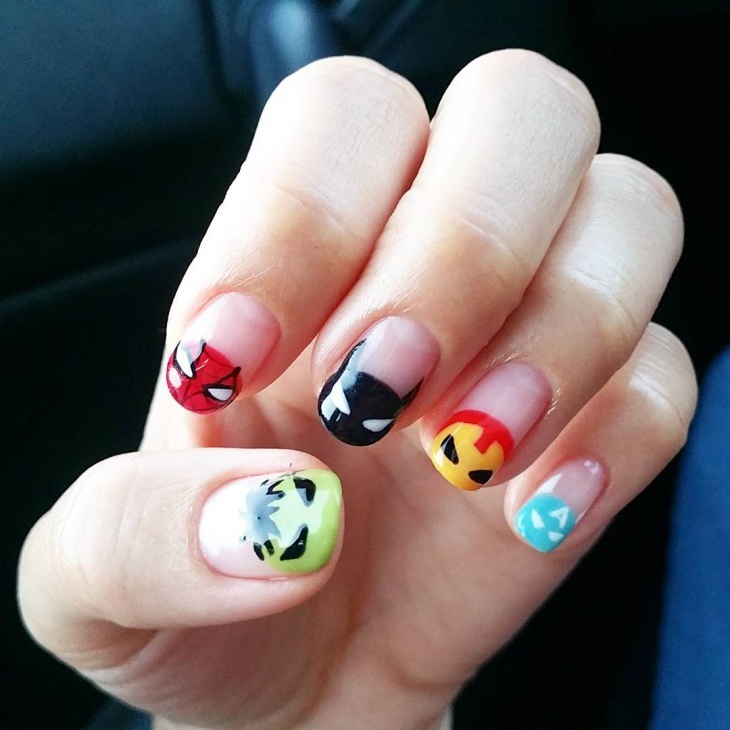 Spruce it up with bright colors and variety of superheroes – and you got yourself a nail art. If you can’t really decide your favorites amongst the superheroes (except a couple of hot Spideys and Clints), how about going for a stamp of the Marvel brand itself? 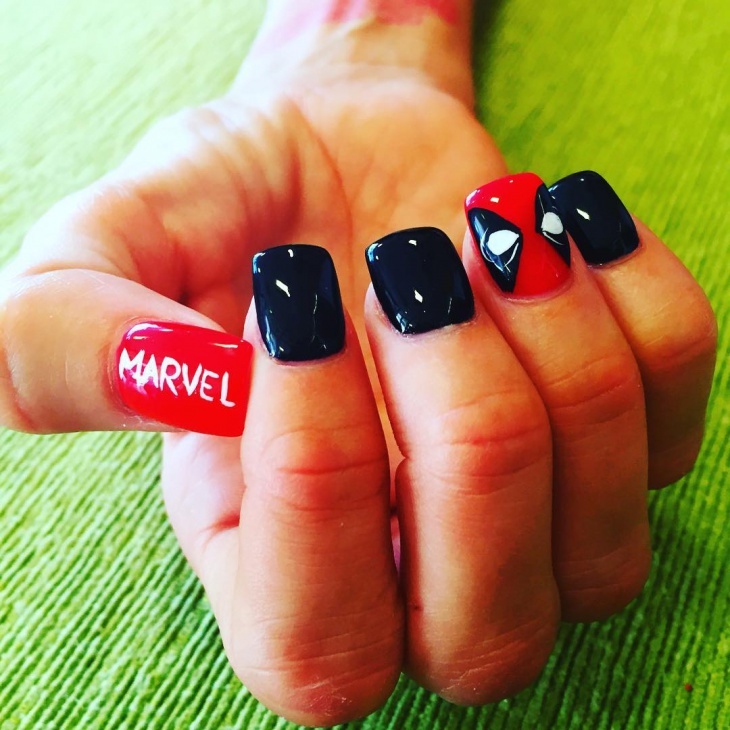 You could never go wrong with the colors, and how cool would be wearing a nail art with Spiderman’s face! 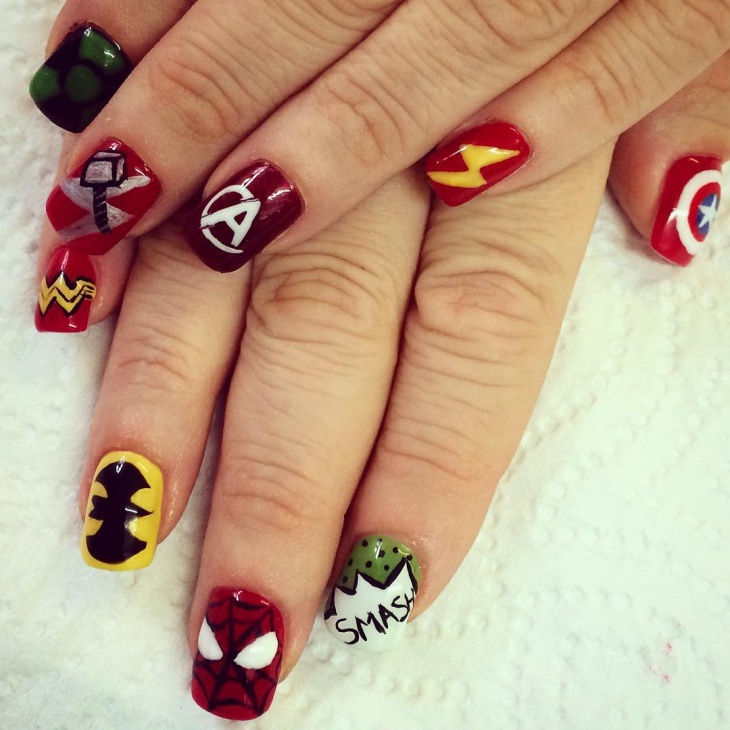 Show your love for the entire comic universe by combining superhero symbols from both, the Marvel as well as DC universe! 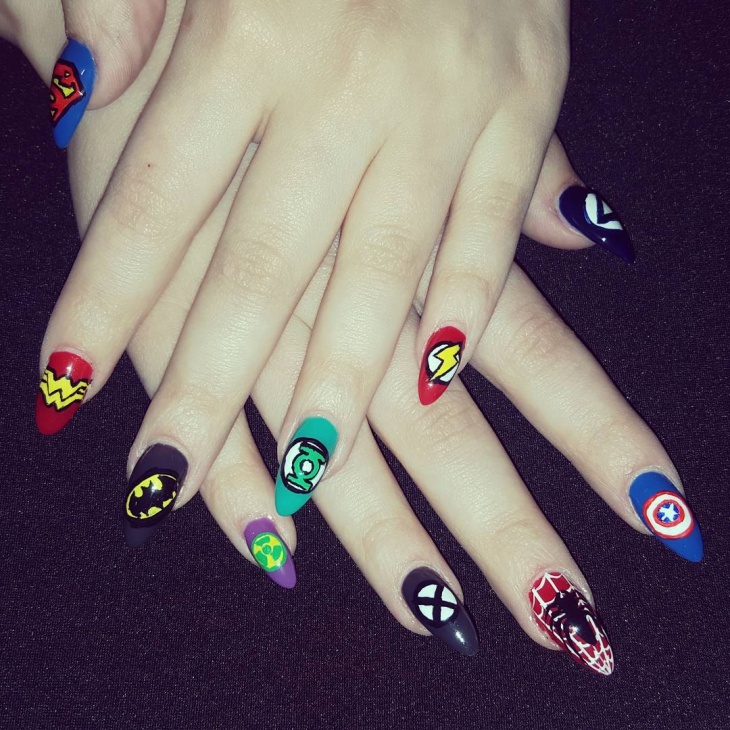 With a combination of Captain America, Batman, Wonder Woman and Hulk guarding your nails, who’s going to stop you from going all Avenger-crazy this season? 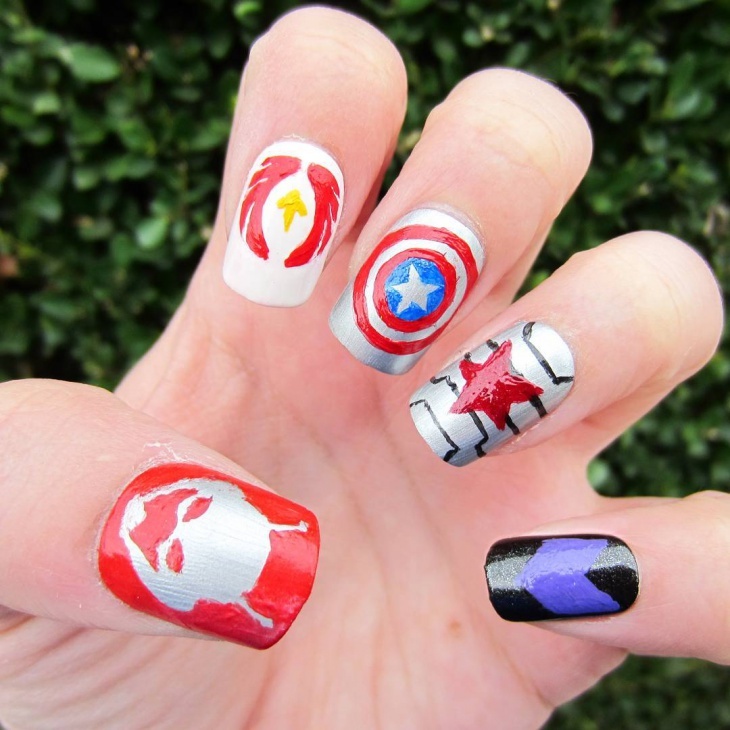 And then there are those who are die-hard fans of the gorgeous and noble Captain America! 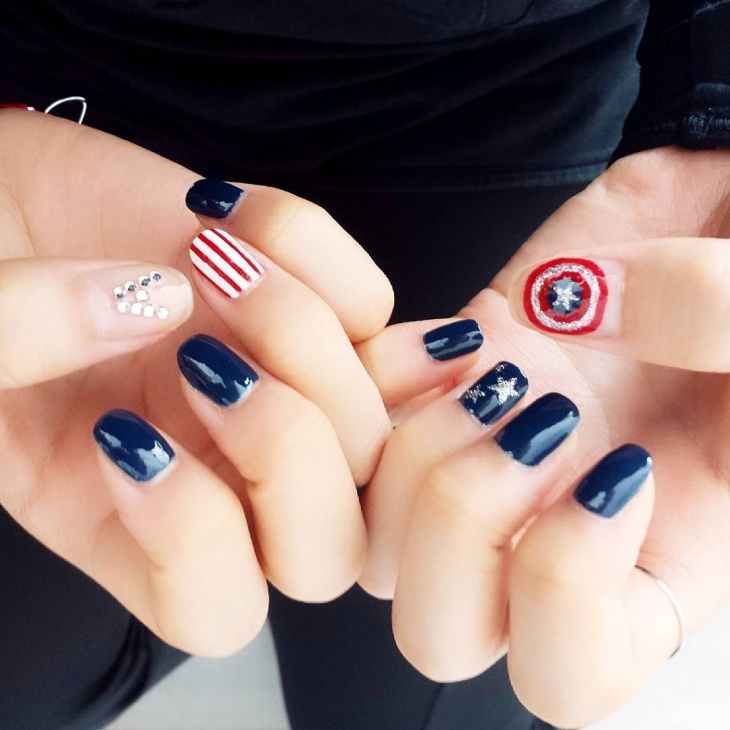 This one is specially for you; paint your nails a dark blue base, sprucing up a couple with stripes, stars and the ever-famous shield insignia. 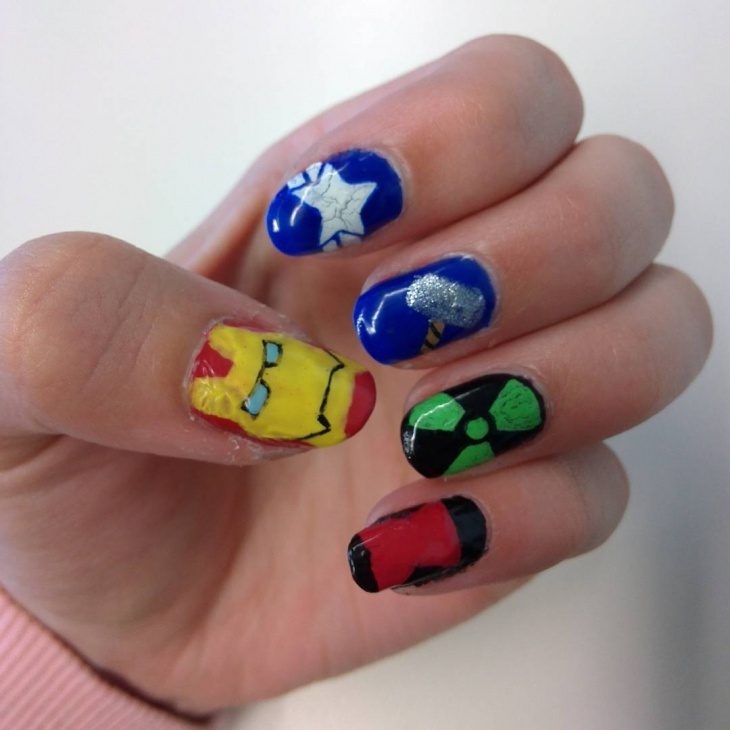 Let your inner fan loosen up with this super-cute nail art! 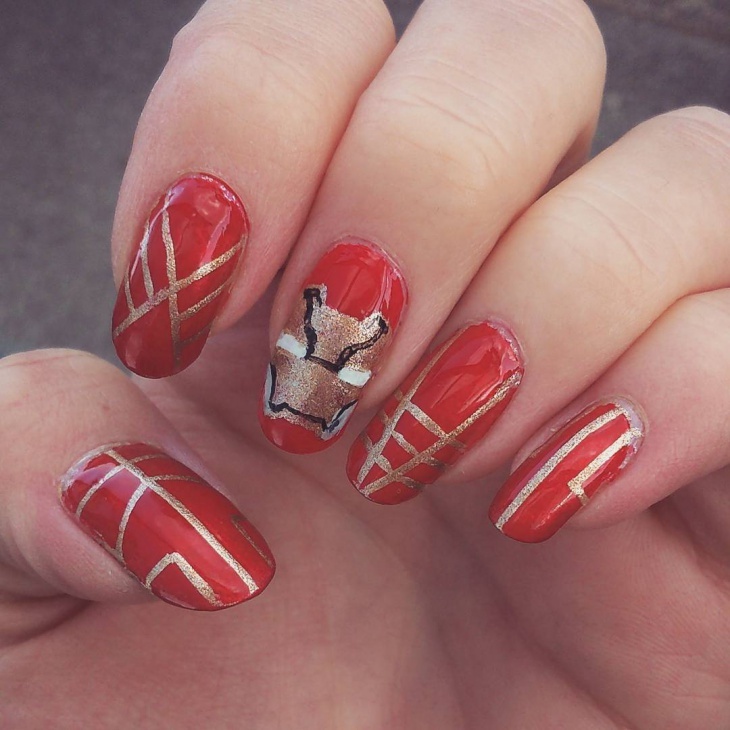 Another variation of the faces and shield symbols, we cannot stop fawning over how very awesome the Iron Man mask looks on these nails! Pair it up with the shield of the Captain America and the Avengers logo, and experience people’s appreciation of your devotion to your fandom. 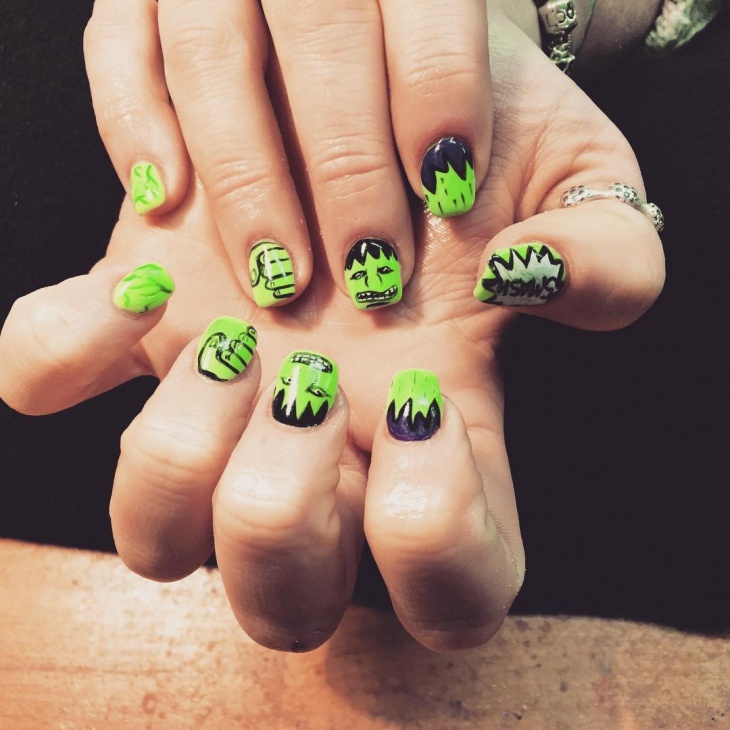 If you are a Hulk fan like us, then this nail art is totally for you! Capture the many faces of Hulk – as they range from blank, to mad, to tear-apart-the-building angry… and smash! 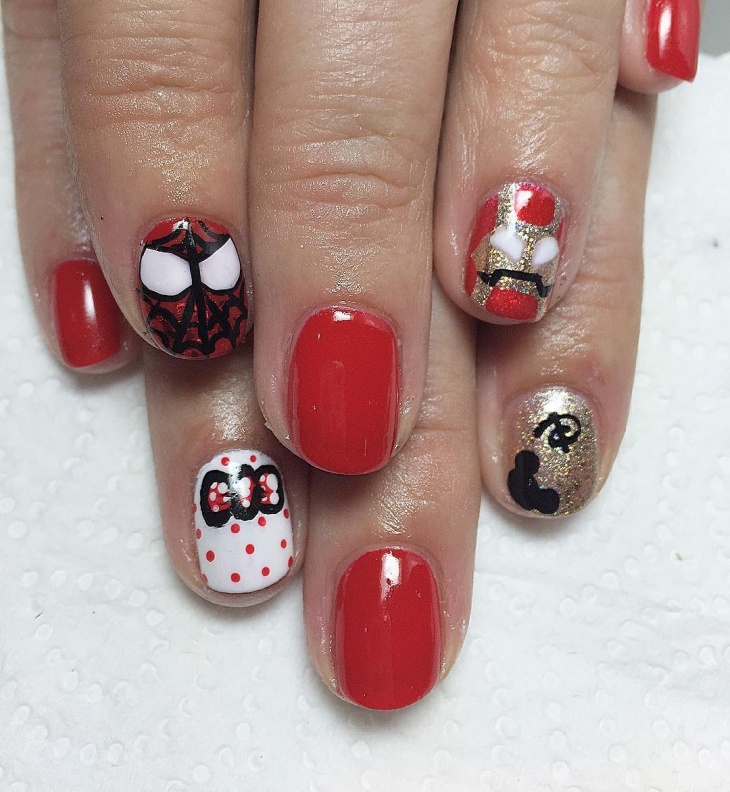 However, do ensure you don’t get into the spirit and go around ‘smashing’ as that might ruin this gorgeous nail art for you. Supporting the Captain America team this season? 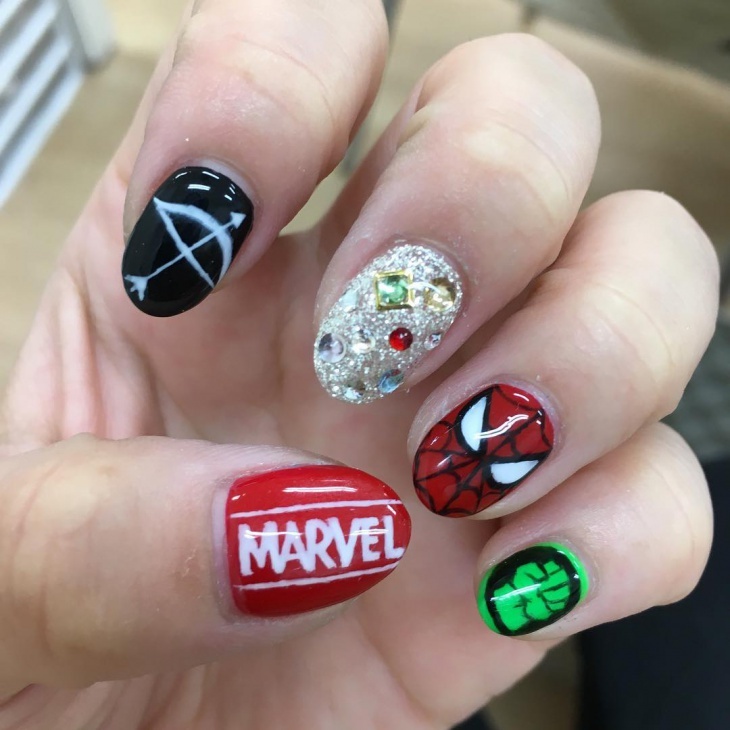 How about wearing your fandom and support on your nails! Covering the entire team from the Winter Soldier, Hawkeye and Ant Man to Falcon and the Captain America himself, give the rest a dose of how cool it is to be a part of the ultimate team! Love the comics way more than the movies? Then why not show your devotion to the awesomeness of these comics. 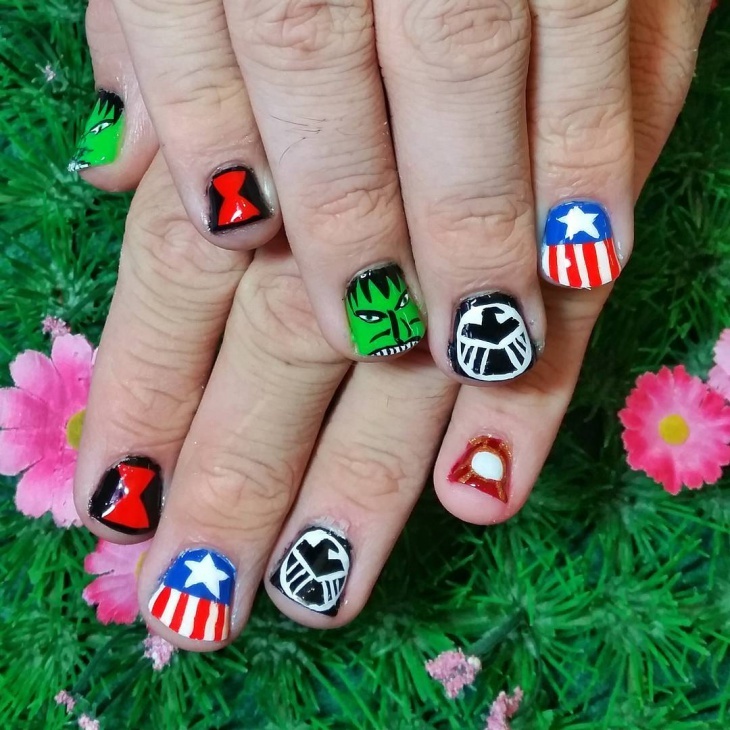 Paint your nails with these brilliant colors from the actual Marvel and DC comic series; let your love not be divided amongst the Avengers and the Justice League! Oh, this is one super cute design we have been waiting to show off to you guys! 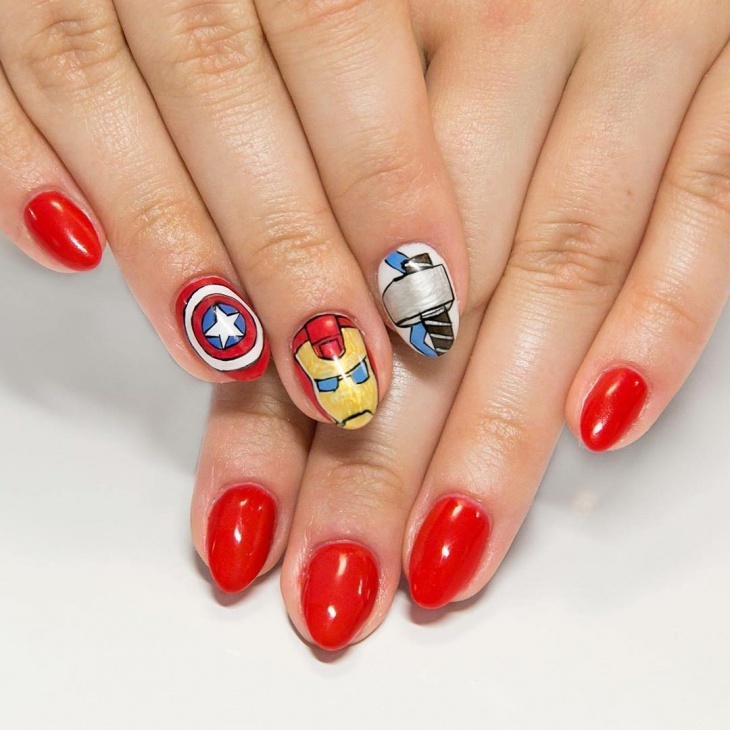 Take French manicure to the next level; stamp your square oval nails with the cool superhero masks for that otherworldly charm. You could also go all ‘rawrr!’ on your fellow-mates with this fun look! Care more for brilliant gothic looks for your nails? Well then, you know which superheroes to choose from the bunch! Whether it be the dazzling Scarlet Witch, her lightning fast brother or the super-cool Hawkeye, Age of Ultron is the part of the Avengers universe you should go for! 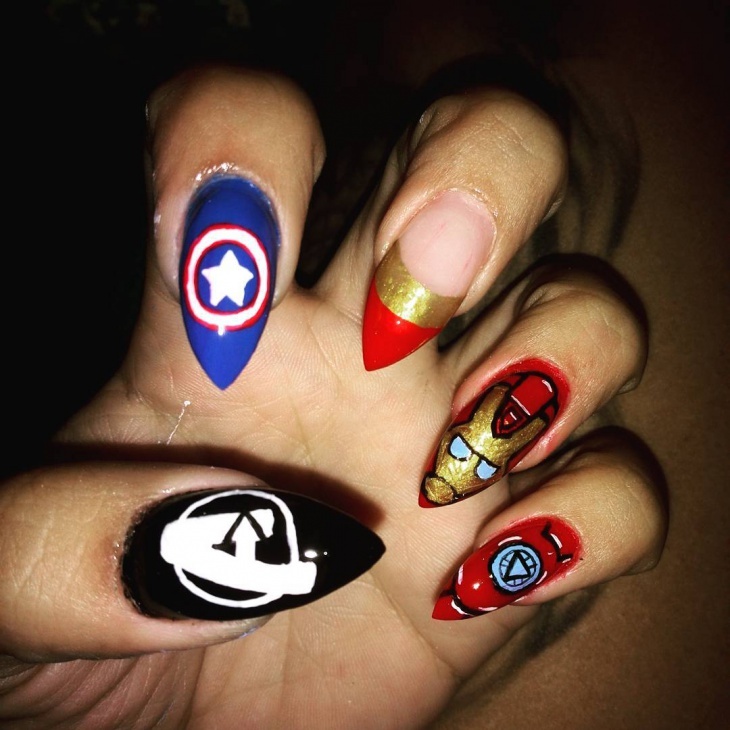 The true fans of the Marvel and DC universe never fail in putting their devotion on display as innovatively as possible! Going for a cosplay event? 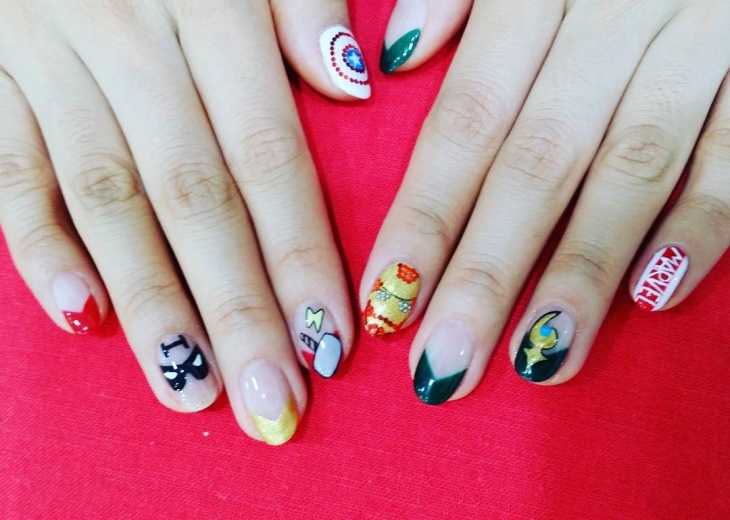 Get an Avengers nail art done! 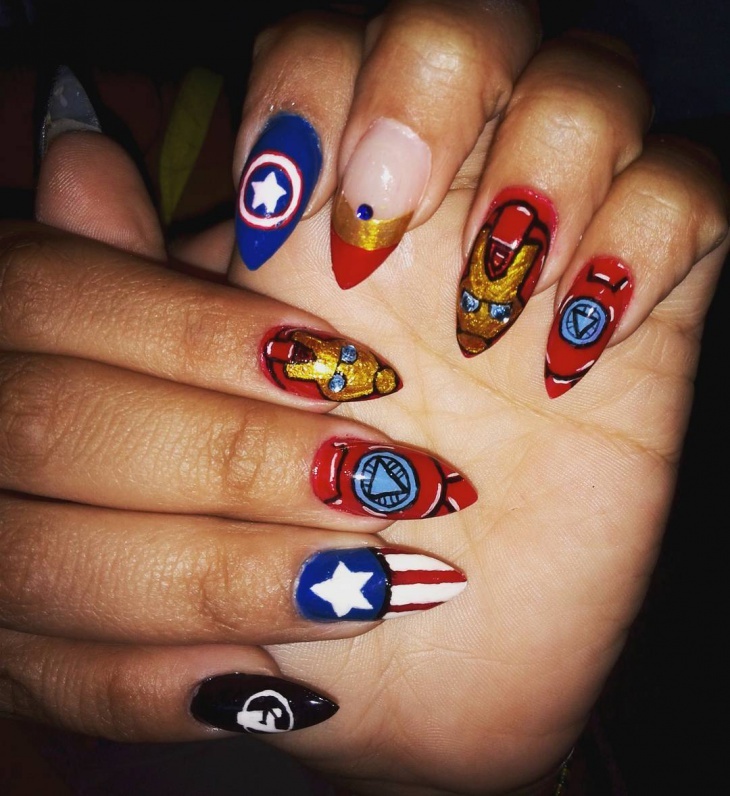 Eagerly waiting to catch the new Marvel movie? 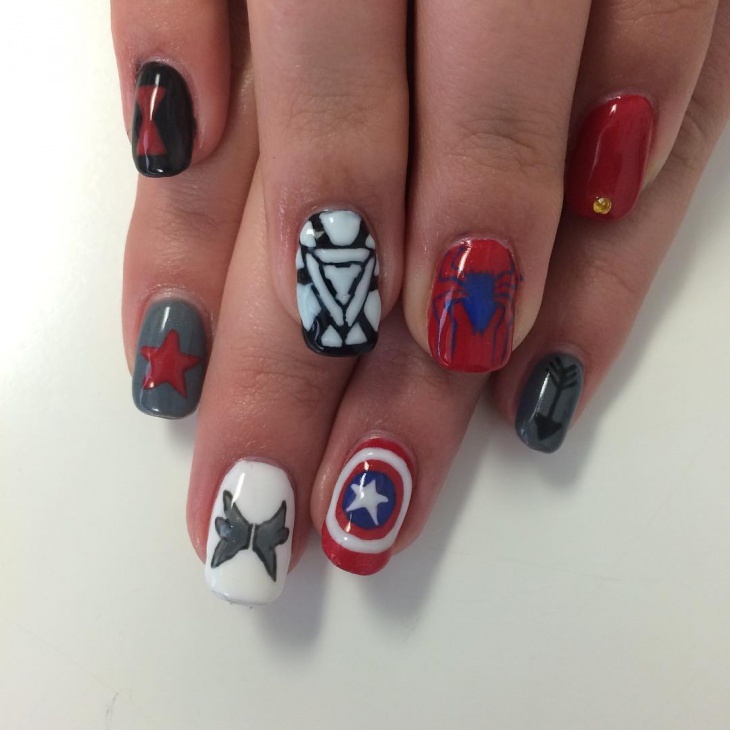 Don’t forget to paint your fandom on your nails! We adore these superheroes, and nearly worship them for their awesomeness, don’t we? 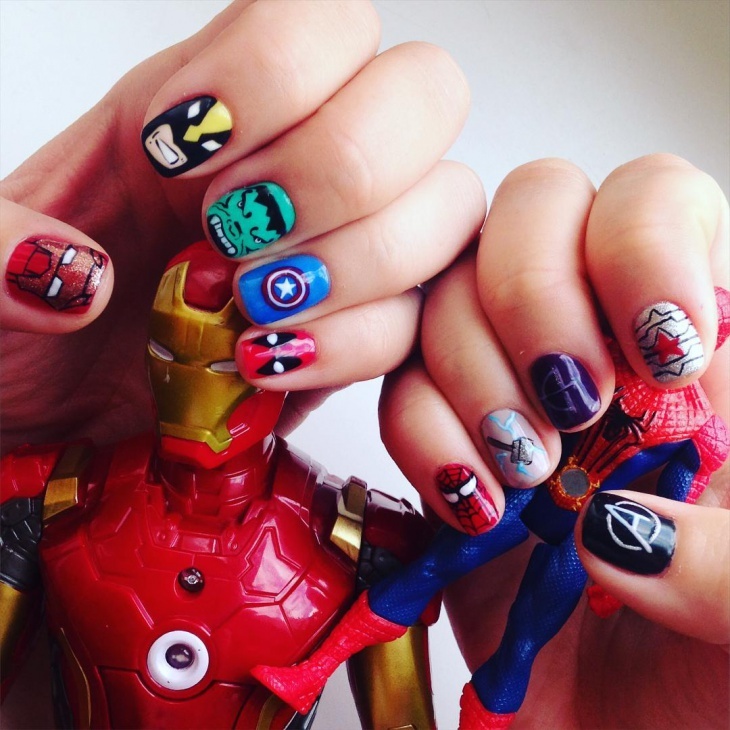 So why not give one of these amazing nail art designs a chance today! Oh and, don’t forget to share your experiences with us in the comments below!